She’ll love this, Jasper thought. He trotted along the pavement with the two-day-dead mouse in his jaws, his long black tail swooping behind him. It was a surprisingly warm Autumn afternoon, and all of the leaves were the hues of a dying fire – a glorious mix of dark green, burnt orange, blood red and earthy brown. Two children, who were riding their bikes, stopped and gasped at Jasper; who at that time completely forgot that he was carrying a dead mouse in his mouth. “Naughty cat” he heard them say. He held his head high and gave them a flick of his tail and continued his journey home. He’d done no wrong. The mouse was dead when he had found it, and it was his job to bring it back to his owner, Morena. He gracefully jumped over the garden fence and entered his home through the cat-flap in the back door. Inside swarmed with all sorts of strange plants crawling up the walls and hanging from the ceiling – the air humid and earthy. Jasper inhaled – home. His home was cosy – books stashed every here and there, candle wax dripped down the fireplace, and assorted teacups were used as makeshift plant pots. The coffee table in the middle of the living room was worn and well used with ring-shaped stains adorning the inner sides and corners, chips and dents framing the outside edge; reminders of many heartfelt and thoughtful conversations. Handfuls of dried herbs and flowers hung around the dying light of the fireplace and on the edges of the bookcases that lined the wall on the far side of the room. Angelica, Borage, Juniper and Primrose were just a few of the dried items Jasper recognised. Jasper pounced upon the dining table, carefully placing the dead mouse on the surface amongst the cuttings of past flowers, twigs and twine. He could hear Morena pottering around in the kitchen; the clinking of cutlery, the closing of drawers and the boiling of a kettle. She walked through with some scissors and beamed a heartfelt smile when she saw Jasper, her salt and pepper hair loose and curly. “Hello, my love” she cooed at him as she gave him a scratch between the ears. She carefully picked up the dead mouse he had bought in. “Where did you find him?” she asked. “He was just on the side of the road,” Jasper replied, “I think it was just natural causes”. Morena pulled a sad face. She hated that her work required the use of animal parts – but she vowed to never hurt a living animal while doing so, so relying on natural causes to take the animals she needs is what she has always done. And it was easy work for Jasper – all the other familiars had to hunt. “I’ll see to him in the morning. Thank-you, Jasper”. Morena took the mouse into the kitchen and began to wash her hands. Jasper took to his regular seat – a spot on the sofa that was perfectly nestled in between the pillows and blankets that adorned it. 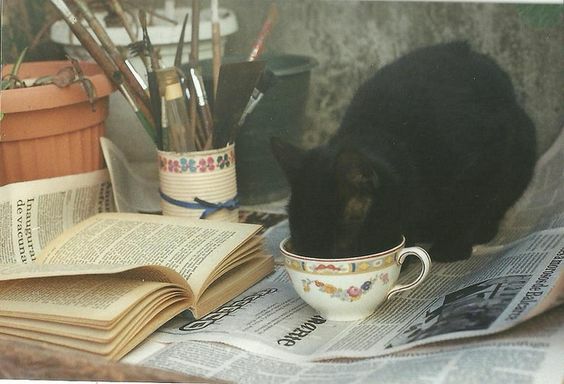 “Who is the tea for?” Jasper purred. “Sophie, the young girl who lives down the road”. Morena, again, came out of the kitchen, this time with a tray of cups, a kettle and some biscuits. “She’s got a big presentation at her school tomorrow, and her mother thought I might be able to help”. Jasper flicked his tail and enjoyed the soft warmth of the dying fire, eyeing up a moth that had just flown in through the window. Morena was rushing around, collecting all of the necessary herbs and flowers she needed for the tea she was going to make for Sophie. “Remember,” said Morena, “not a word from you. You’ll probably scare the poor girl to death! And her mother too!”. “I won’t; I won’t!” Jasper smirked, remembering the last time he spoke to an unsuspecting visitor – their face! “You better not. That poor woman had to have therapy for a year because she thought she was going crazy because she thought cats could talk to her!”. Jasper chuckled to himself and cosied further between the pillows on the sofa. Morena was chopping the last of the herbs when a little knock sounded from the front door. Jasper bolted up, and along with Morena, they greeted their guests. Helen was a tall woman, with soft curly hair, a freckled face and glasses, the kind of woman who looked like she had sprung out from a well-loved book. Kindness surrounded her like an aura. Sophie, on the other hand, was a small girl – much smaller than all of the other girls in her class. She wore her hair in plaits and, just like her mother, freckles dotted her face every here and there. She gave a warm yet timid smile but beamed even more when she saw that Jasper had come to greet her too. Sophie’s mother beamed that same warm smile as she was greeted at the door, her hair a little tousled from the slight Autumn breeze. As Sophie and her mother sat down at the table, Jasper made a point of introducing himself by jumping up onto the table and nuzzling for scratches, purring loudly. “I see you’ve met Jasper…” Morena chuckled, “he loves the attention”. Morena started pouring hot water into the teacups. “What’ll it be for you my dear? The usual?” she asked Helen. “Ooh, yes please,” said Helen, wiping away the condensation from her glasses. Morena wandered into the kitchen and returned with three glass jars filled with different teas. One of the jars read ‘Content’, the next ‘Confidence’, and the last one ‘Breakfast’. She placed the jars upon the table and began serving the tea. “So, Sophie,” said Morena as she added a sugar cube to her tea, “what’s your presentation at school about?”. Sophie had already begun tucking into the biscuits – an assortment of custard creams, chocolate digestives and bourbons. “Oh, that sounds very interesting!” beamed Morena. “She knows all of the facts,” said Helen, “it’s just speaking in front of people that you’re not so keen on, isn’t it sweetheart?”. Helen leaned towards Morena. “I thought you might be able to help?”. “Of course I can help, dear.” Morena pushed the jar with the label ‘Confidence’ towards Sophie. “Put one spoonful of this in your tea in the morning and it’ll keep the nerves off all day”. “Thank-you so much Morena, it means a lot” thanked Helen. “There’s no need to thank me, dear. Oh…” Morena remembered. She pushed the other jar labelled ‘Content’ towards Helen. “This one is for you! I’ve made it a little bit stronger than the last batch”. Helen let out a heart-warming smile. “Thank-you so much”. It was barely audible, but filled with gratitude and hope. She clung to the jar and held it tight, took a deep breath and continued her warm smile. Sophie had made her way through the biscuits. “Thank-you so much for the tea,” said Helen. She gestured towards the cups of tea on the table, “and the tea…”. Morena led Helen and Sophie to the door and saw them off on their way home, watching them as they trailed off down the road, the night sky dark and the wind still slight. “You know, you really should start charging people for this tea that you make them,” said Jasper as he swirled around Morena’s ankles. She threw him a playful grin and walked back inside, prepping for the next batch of tea for another person in need. Morena hummed as she dallied about in the kitchen once again, taking dried flowers and herbs from every here and there. Jasper’s fur stood on edge – his tail stiffened. A slow knock came from the front door. “I knew they probably forgot something…” Morena giggled as she walked back through the hallway and reached for the door handle. Morena opened the front door, but it wasn’t Helen, or Sophie. A figure dressed in a ripped and worn dark material was standing outside her house. The stench was unbearable, like rotting flesh. Morena felt her stomach drop. Dark liquid seeped from his mouth as he unleashed the widest of grins. Morena stood there, frozen in the doorway of her house. She could feel a chilling breeze creeping around her, crawling across her body. “Who are you?” she questioned, her voice deep and hushed, her stance ready and strong.